What makes Backyard Basecamp truly amazing? The heart and soul of Backyard Basecamp - our Summit Program. While we have fun adventuring outdoors: exploring mountain trails, camping, swimming, and playing, your Basecamper will be working to reach Mount Everest! No, No, not the big tall mountain in Nepal. (Maybe someday, right?) We’re talking about the highest award a Basecamper can achieve - The Everest Summit. This isn’t an achievement that can happen overnight. In fact, Basecampers likely won’t achieve Everest for a few years. The trail to Everest is a long one - it takes hard work, commitment, and a little bravery, but the “views” from the top are amazing! The Everest Award is earned after mastering many mountaineering skills, offering service to others, and practicing environmental protection habits. This award is a symbol of years of dedication to nature and marks it’s recipients as leaders on and off the mountain. Our Summit Program will only fully be realized for Basecampers with the support of their parents. Read along below to see how you can support your child in reaching the prestigious Everest Summit! While working towards Everest, Basecampers will advance through other Summits (no one summits Everest until they’ve “trained” on smaller mountains!). 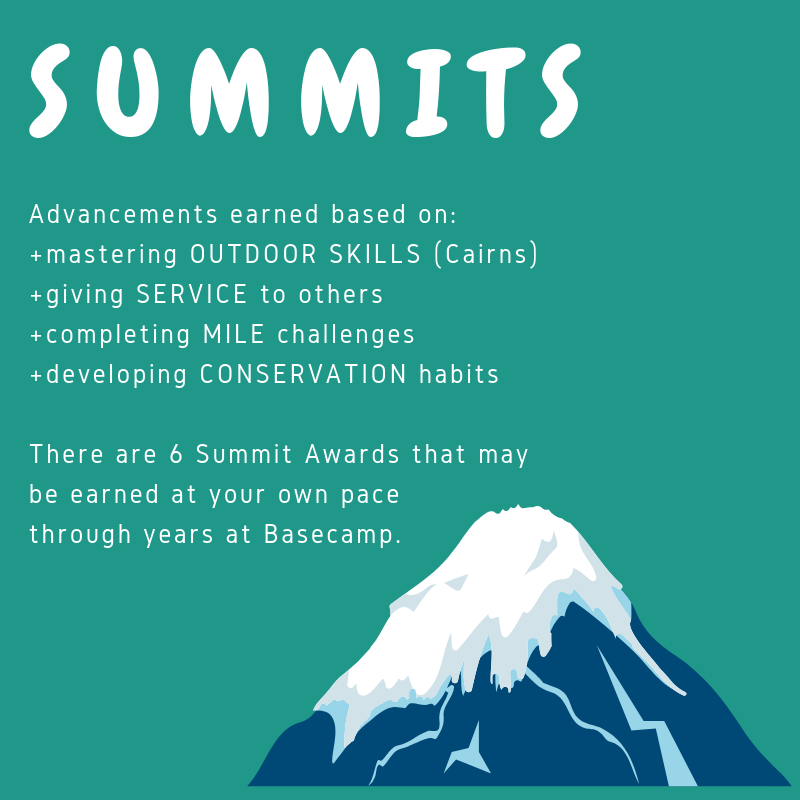 These Summits mark a Basecamper’s rank advancement in the program. Fuji, Teton, Matterhorn, Kilamanjaro, and Denali Summits must be reached before Everest. Along their Basecamp journey they pass “trail makers,” called Cairns, that show their progress in specific skills. Both “Cairns” and “Summits” mark your child’s progression as a skilled Basecamper. *Basecampers track their own progression and “pass off” requirements with Basecamp Guides or Parents. When we refer to the “Trail to the Summits” we are speaking of our extensive and growing achievement program designed to help kids master mountaineering skills, environmental education, awareness practices, and connection with others and nature. Without your encouragement and support, your child’s Backyard Basecamp experience will only partly be realized. Our intricate curriculum and achievement system is designed in a way that about 80% of skills and learning takes place and can be mastered within “Camp Weeks.” The other 20% must be achieved once the Basecamper returns home from camp. Much of this learning may still realized independently, with parental encouragement and check-ins. Our curriculum exists within the metaphor of hiking a trail, where children are reaching “Cairns” and “Summits” as they travel along this path. Cairns (trail markers) exist as evidence of specific skill mastery (i.e. hiking, climbing, camping, cooking, navigating, etc.) and Summits mark a rank advancement in the program (typically associated with age). Your child will track and log their completion of their Cairns and Summits as they work through them. It is up to Guides and parents to check-off achievements and ensure completion. At Basecamp, this is not merely a “where do I sign?” moment, but rather an opportunity to talk about the child’s experience mastering that Cairn or Summit. We hope this practice will be echoed at home. Many requirements will be best shared with the whole family whether on your own camping or hiking trip or simply a walk through the park. We expect you will find these “requirements” fun and inspiring as opposed to difficult and cumbersome. By way of example, let’s say your Basecamper returns from Camp, excited about their newfound camping skills. They eagerly tell you about how they learned to build a fire and cook dinner over it! They show you their “Cooking” Cairn section of their Field Guide and you see they’ve completed all but one requirement. They ask if your family might go on a camping trip next week so they can practice “building three structures to start a fire.” While on the camp out you oversee them as they show you all they’ve learned, excited to pitch in with your tinfoil dinner for the evening. You help them complete this Cairn by signing off the last requirement and validating their learning and confidence by listening to their stories! Once complete, you may go online to purchase the Cairn patch and help them attach it to their Basecamp Rucksack. Next year, your Basecamper will proudly display their achievements to their Crew! Each year, in late August, at the end of our summer season, we host a Backyard Basecamp Summit picnic in Prospect Park where we gather with our family community and recognize and award Basecampers for their Summit and Cairn achievements. The Summits are laid out in a way that you can (and should!) earn one every two years in order to stay on track. Of course, if you join the program later, or get a little behind, you’re welcome to work on the lower Summits that you haven’t quite reached. For example, if you entered the program as a Pioneer, you wouldn’t have had opportunity to complete your Teton or Fuji Summits. While you work on the Matterhorn as a Pioneer, your guides will naturally cover the information for these Summits that are usually achieved by Bushwhackers and Explorers. You take this learning into your own hands and when you find opportunities to pass off those Cairns and goals, do so! It is totally possible to earn all three Summits (Fuji, Teton, and Matterhorn) during your two years as a Pioneer. Most of the Cairns and Summits will require your time and effort both IN Basecamp and OUT of Basecamp. For example, for a Hiking Cairn, you might pass off 4 out of 5 requirements while participating in a summer Basecamp program. However, to finish this Cairn, perhaps you plan a hike with your family where you can complete your final goal. Once finished, have your parent sign off in your Field Guide, and you may order your Cairn patch online. At the end of each year we hold a “Backyard Basecamp Summit” where parents, guides, and fellow Crew-members may gather to be recognized for their hard work and achievement. Summit patches are awarded at this time. Check out the SIX Backyard Basecamp Summits that you can earn! CHECK BACK IN MARCH TO DOWNLOAD THE FULL BASECAMP TRAIL GUIDE HERE. You’ll be able to start working on Cairns and Summits with your family at home and on your own adventures!